« Counting Sunspots: How hard can it be? 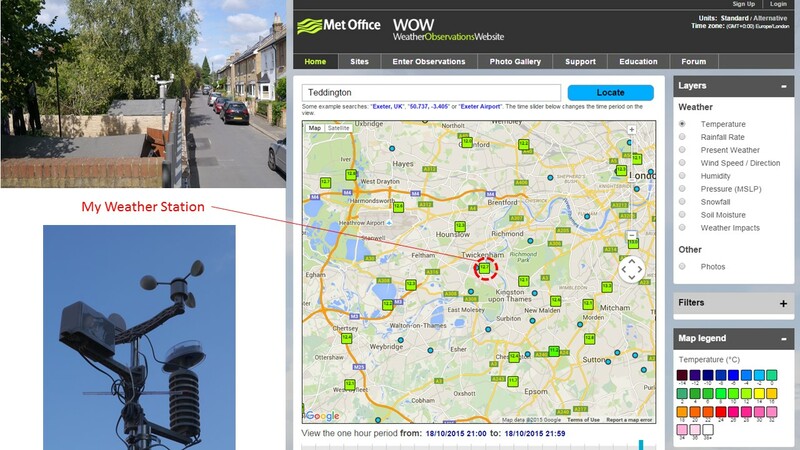 My weather station sends its readings to the Met Offices Weather Observations Website every 10 minutes. Click for larger picture. This summer I bought an automatic weather station. This article is about which one I chose, how I set it up, and how I got my data off the weather station and onto the web! If this kind of arcane detail doesn’t interest you, then walk away now. In a future article I will look at the data and recount some the fascinating tales that it tells, but this article is just about the experience of setting up the station in the hope that it helps someone out there who wants to do the same. On my personal weather website! On the Met Office’s Weather Observations Website (WOW). Type in ‘Teddington’ and my station is pretty much in the middle. Click on the symbol and you can view details about the site. Choosing a weather station is tricky because there are many to choose from – but none of them give any guarantee that they will allow uploads to web sites. Having recently visited the Meteorological World Expo in Brussels, I am very aware that a professional grade weather station is likely to cost at least £1000. However I wasn’t prepared to spend anywhere near that. So after hours of reading reviews I picked a £90 model from Amazon: (link here). A reviewer said it could be used with Cumulus software. And Cumulus software said it could export data to web pages, WOW and Weather Underground. Although all the parts were present, and I enjoy this kind of assembly, putting all the parts together was tricky. The main reason was that although the picture on the front shows all the components at rather jaunty angles, in fact there is not much choice about the assembly! The tiny solar panel which sits on top of the thermometer screen has to face south – otherwise it won’t charge optimally. The alignment of the wind vane also has to be aligned with a particular notch facing North. After that there is little choice about position of the rain gauge. So assembly took a couple of hours, and then I popped in the batteries. The weather station took two re-chargeable batteries – which were supplied – and indoor readout unit took two AA batteries. And immediately the weather station began to work, linking easily to the indoor monitoring unit. I left it working this way for a week or so – just placed awkwardly on a table in the garden. This was when I noticed that if the solar panel was not aligned properly, the weather station would not charge and the station would stop working. So now I had a working weather station. What did it consist of? 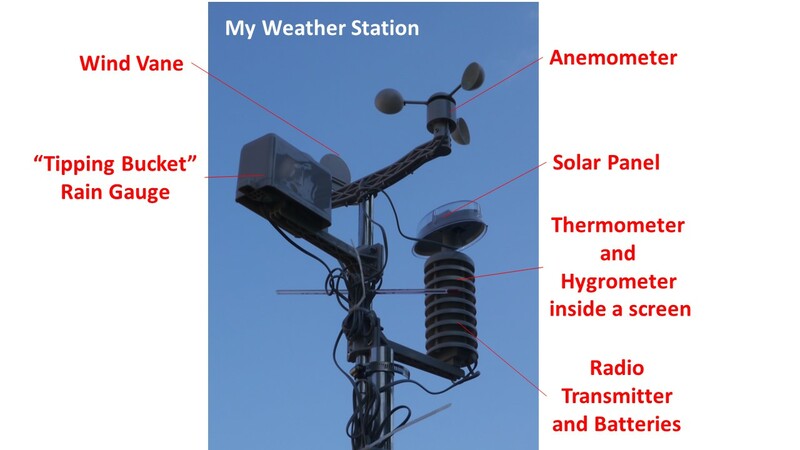 Photo of my weather station with the various parts labelled. See text for details. First was a wind vane. This outputs the direction of the wind, with 0 degrees indicating wind from the north and 180 degrees indicating wind from the south. Second was an 3-cup anemometer to measure wind speed. Third was a combined thermometer and hygrometer – or humidity meter. These were inside a plastic unit about the size of a telephone handset which was placed inside a ‘screen’ designed to shield the unit from direct solar heating. Finally there was tipping-bucket rain gauge. This ingenious see-saw like device (invented by Sir Christopher Wren and Robert Hooke) records the amount and rate of rainfall. As a small bucket fills it imbalances and when it tips a single ‘tipping event’ is recorded. Cleverly, the tipping event engages a second bucket which catches the stream of rain without a gap. Hidden in the thermometer-hygrometer unit are two rechargeable batteries linked to a small solar panel positioned on top of the thermometer. Together the solar panel and the batteries supply power to read the sensors and operate a radio link to a battery-powered readout unit which is kept indoors. I consider that good value – especially since it worked straight out of the box! Understandably the quality was not everything it could be. Most significantly, the unit was manufactured in grey plastic not white! For the thermometer screen in particular, this is a poor choice of colour. Siting and exposure: where to put it? Traditionally weather stations are placed inside ‘Stevenson’ screens – white, louvred, enclosures designed to protect the thermometer from direct sunlight and rain. The aim is that as far as possible, the thermometer should measure the temperature of the air. 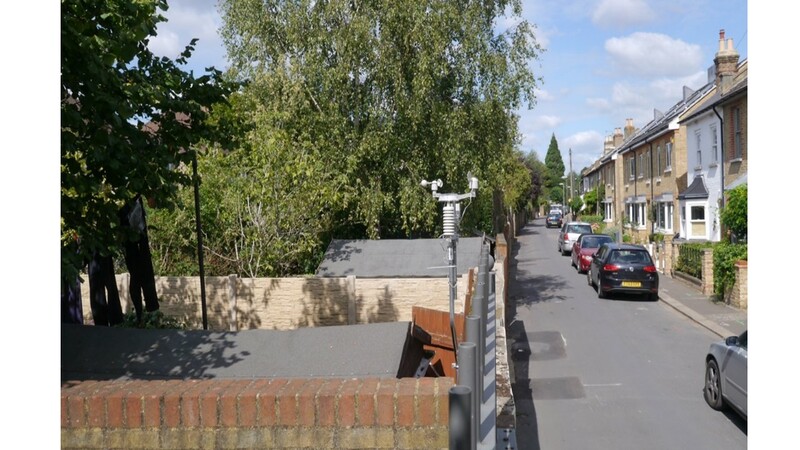 Additionally weather stations are usually positioned in open areas away from trees and buildings. Obviously, that wasn’t going to be possible in my garden. Instead I chose to mount the device above the back wall of our garden. I chose this because I thought it would be better than in the garden – where the walls would create a sheltered environment. In short, it is poor siting, but the best I could manage. The view from the South looking North showing weather station mounted on the back wall of our garden. I bought a television antenna mounting kit, and firmly attached an antenna mounting pole to the wall. Then I attached the weather station to this pole using the fittings supplied with the kit. It is hard to overstate the importance of the siting and exposure of the weather station. For example, the temperature of the air can easily change by several degrees on raising the station just a few metres above the ground. Similarly, the humidity and wind speed also vary strongly with height. One of the main requirements for a valuable weather station is that it should operate around the clock. This is not easy to achieve, and here I describe what I have done so far. The outdoor components have so far (it is October 11 2015 as I write) managed to charge enough during the day to keep the unit operating all night. I will test this through the winter which has minimal sunlight and during which the cold may affect the operation of the batteries. If it fails I may need to run a power supply across the garden. The indoor components are located in our converted loft – out of the way of our day-to-day life. The indoor unit is battery powered but I have just a bought a mains replacement unit and now I won’t need to worry about the batteries running out. The indoor unit is linked via a (supplied) USB cable to a Windows XP laptop dating from 2005. The screen is failing and there are many lines of blank pixels, but the computer is adequate to run the Cumulus Software. 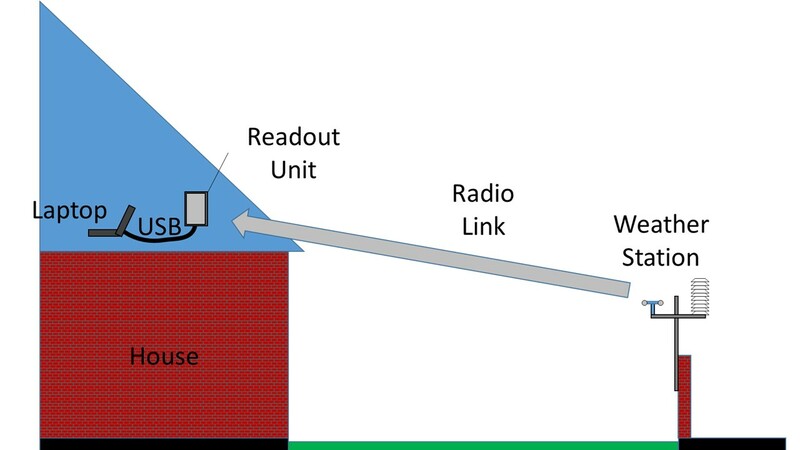 Schematic diagram of the way the weather station links to a laptop , and via that, to the web. There have been two interruptions to data streamed to the web. The first arose from the old ‘Windows Update’ dialogue box which locked the computer until a response was made. I have now fully disabled this. The second occurred when – for no reason that I could determine – the computer lost its WiFi link to the internet. Moving the computer few centimetres restored the link. In short, keeping the system working 24/7/365 is non-trivial but I am aiming for greater than 99% availability – i.e. less than three-and-a-half days lost each year. Helpfully, the Weather Underground sent me an e-mail after the system was unavailable for longer than two hours. The Cumulus software includes options to publish data to a website, to link to WOW and to Weather Underground and to other sites that I have not chosen to link to. The software is ‘donation ware’, but it is so good that I gave £20 to its author. Calibration? I’ve heard of it. I have deliberately avoided calibrating the unit because I wanted to see how this unit performed ‘out of the box’. One interesting check of the data is to compare it with neighbouring weather stations at night under a cloudy sky when the temperature is rather uniform. 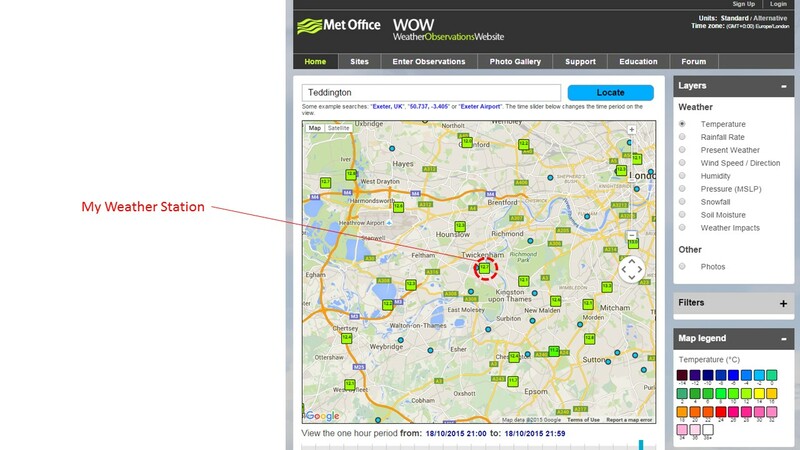 As the screenshot from the Met Office’s WOW site shows, the unit reports similar temperatures to its neighbours. When my station read 12.7 °C, its three nearest neighbours – each about 1 km away in three different directions – read 12.3 °C,12.1 °C,12.3 °C. I consider this level of agreement surprisingly good, indicative that the station is probably not reading too incorrectly. Screenshot from the Met Offices WOW website which allows me to compare my readings with those from neighbouring sites. Click for larger image. So far this has been fun, but the real fun is about to begin. As the station builds up a record of the data for the year, I get quantitative insights into the weather world around me, that helps me to make sense of what I experience. Gazing at the single full month of data I can already see fascinating stories developing. But I will write more about the data next week. This entry was posted on October 19, 2015 at 10:00 am and is filed under Climate Change, Personal, Simple Science. You can follow any responses to this entry through the RSS 2.0 feed. You can leave a response, or trackback from your own site. I have already a weather measurement station at my house terrace, but it works not good. Recently I have purchased a new one, which has works perfect showing the accurate weather report after searching the best reviews from below site link. It has given me the accurate date of the products.